How far does that model go? The Great Pyramid can be seen as a scale model of the earth. How far does that model go? Two scales, planetary and solar system: Planetary Scale is the generally accepted factor of 43200. Pyramids and monuments represent solar system objects displayed at that scale. Distances between objects use the Solar System Scale at 1 light-second per meter. 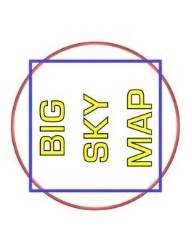 The Big Sky Map will challenge ideas in flat earth history.